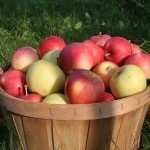 A few weeks back I published a list of 12 foods, coined The Dirty Dozen, with the highest levels of pesticide residue. So the question becomes: what are the “safest” foods to eat if organic is unavailable or unaffordable? With the looming fiscal cliff, there may be even less money to spend at the grocery store. I pray our government can work together, but that’s a discussion for another day and another blog…. Our taxes may be going up, but…. 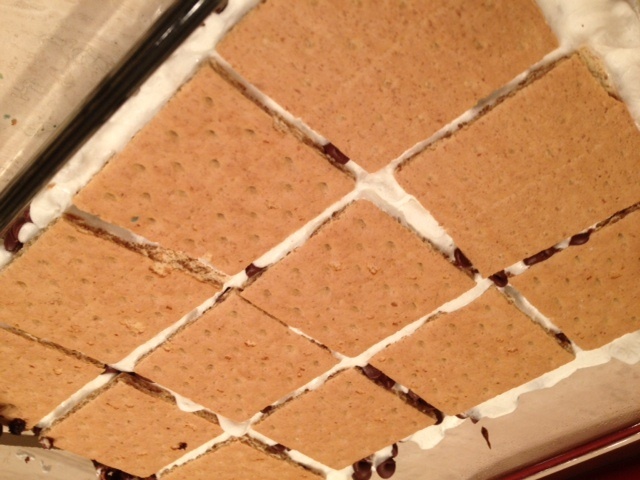 …well not sure how to put a positive spin on rising taxes, but the brownie s’mores I’m eating right now help! Some of my favorite days as a chef are spent perusing the farmer’s market for local delicacies (and sharing them with you). 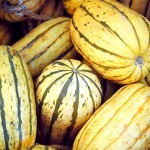 Last week I discovered Delicata squash, with its distinctive green vertical stripes and bright yellow/orange background. 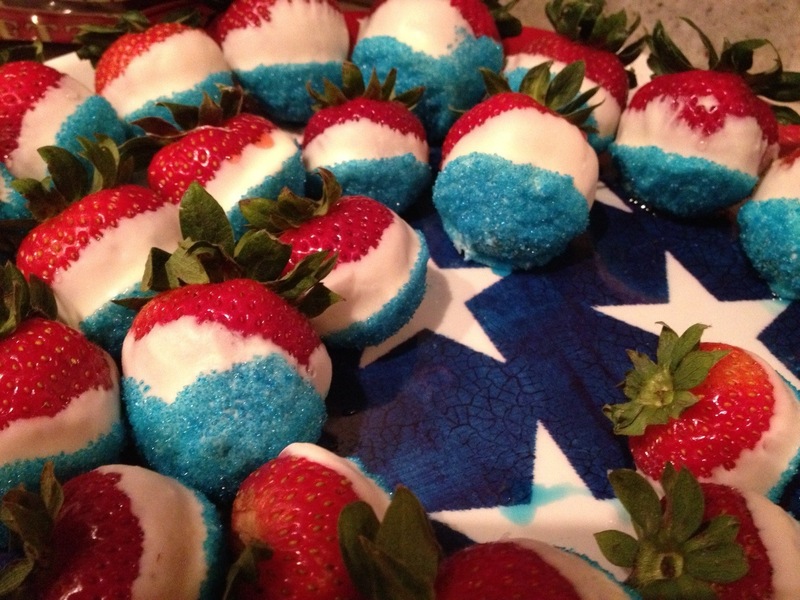 Visually striking and a flavor that is rich, creamy and downright delicious. 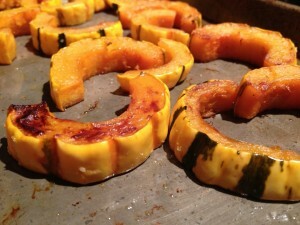 And did I mention that this squash does not need to be peeled!? 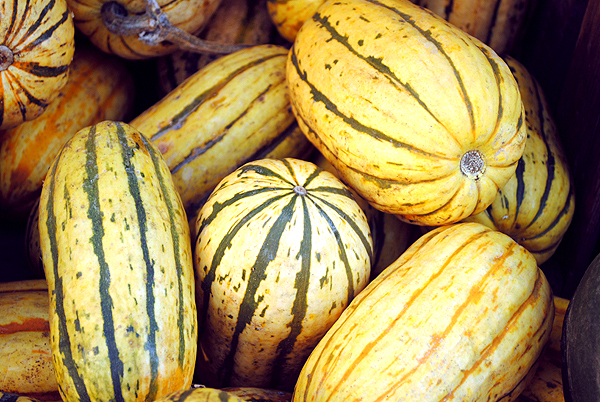 According to Wikipedia, it is also known as Bohemian squash, peanut squash (given its distinctive shape) and sweet potato squash. Inspired by this “Bohemian” vegetable, I put on some Janis Joplin and me and Bobby McGee got cooking. 1. Preheat oven to 425 degrees F. Cut squash in half lengthwise, scoop out seeds and then cut into 1/2″ thick moon shaped pieces (do not peel). 2. 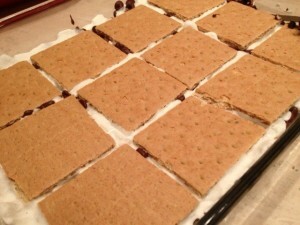 Spread on a small sheet tray, drizzle with olive oil and salt and toss to combine. 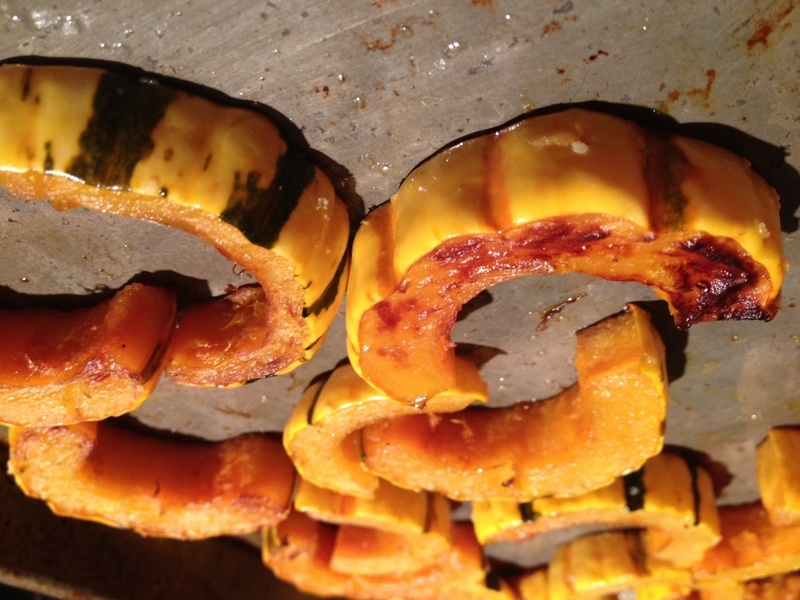 Bake for about 25 minutes, turning halfway through, until squash begins to caramelize and is tender to bite. Serve immediately…. 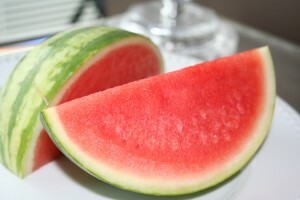 fiber-rich skin-on and all! Quintessentially Fall: football, apple picking and, my favorite, Brussels sprouts. Growing up, these “sprouts” (small heads that resemble miniature cabbages) were a household staple that my sisters and I despised. Sorry mom, but unbeknownst to you, the microwavable frozen variety with a little Molly McButter was often passed to Kiki under the table. Those days are long gone and now I enjoy Brussels sprouts roasted, caramelized, sautéed and even raw…yum! Here’s a delicious recipe, elegant enough to serve at a dinner party or simple enough to prepare for a weeknight family meal. 1. Whisk lemon juice and honey and then slowly stream in oil. Season with salt and pepper. 2. 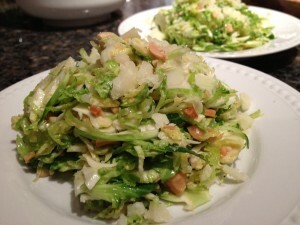 Toss Brussels sprouts with dressing and half of the almonds. Adjust seasoning if necessary. Allow salad to rest for at least 15 minutes to absorb flavors. 3. Divide salad among 4 plates, garnish with remaining almonds and cheese. Note: To save time, shred Brussels sprouts in a food processor fitted with the thinnest shredder attachment. 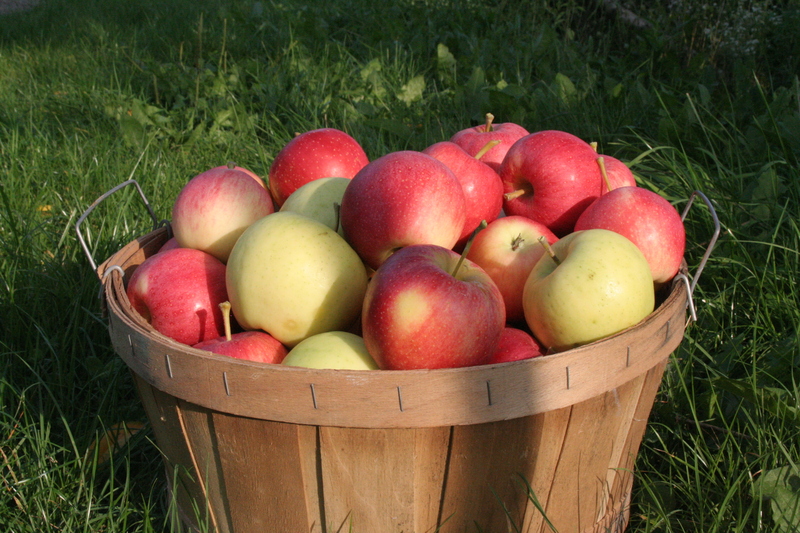 **For added sweetness, toss in some julienne apples. No, this isn’t a posting about Carly Rae Jepsen’s [annoying, yet catchy] hit song. An article was published this week in The Washington Post citing a recent study done by Stanford University that “organic foods offer no more vitamins and nutrients than conventional products.” Now make no mistake, this article was not discouraging consumers from buying organic. It was merely pointing out this common misconception people make about organic food. Personally, I don’t buy organic foods for what they do have, but rather, what they don’t have…. Call me crazy, but hormones, pesticides, synthetic fertilizers, genetically modified organisms (i.e lots and lots of chemicals) just don’t sound super appealing in my morning bowl of yogurt and berries. Forgetting the fact that I think organic foods just taste better! And if you still need convincing….well then….call me, maybe?